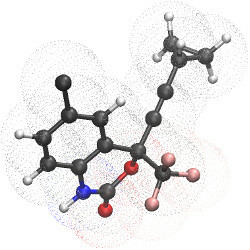 TUTORIAL B4: Simulating a pharmaceutical compound using antechamber and the Generalized Amber Force Field. This tutorial covers setting up an advanced system. In this case it shows you how to set up a dye system that is covalently bound to DNA. It also includes manually running multiconformational RESP fits, building custom units and assigning parameters manually. This tutorial is somewhat replaced by the tutorials directly above and below. However, it is kept here since it shows our original method for creating a system containing nonstandard residues, in this case a metal atom. A new unit is generated in xleap in order to simulate the plastocyanin system with a bound copper ion. There are two versions of this tutorial. The first is a simple version which creates just a new copper residue and approximates it as a +1 ion. 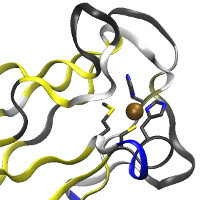 There is also a more advanced version where new special histidine and methionine residues are created so that different charges and bond / angle and dihedral parameters can be used. 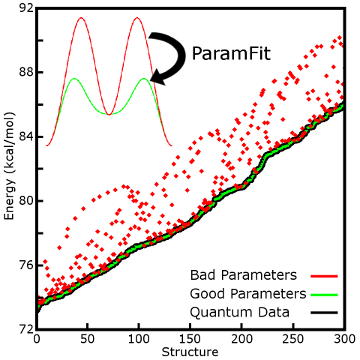 In this tutorial we will generate force field parameters for two small molecules from ab-initio quantum calculations using the AmberTools program Paramfit. 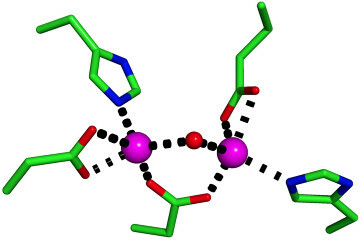 This tutorial generates the phi and psi dihedral potentials over two different small peptide chains, and details each step of the parameter generation process from preparation of a conformational sampling of each structure to generation of quantum data to evaluating the quality of the resulting parameters. This example will guide users through the process of making charges for glycerol appropriate for simulations in liquid water. This functionality in the mdgx program offers a self-contained and highly adapatable way for users to create charges tailored for specific environments and understand the level of accuracy. This example showcases the mdgx bonded parameter fitting capabilities, taking the glycerol from the previous tutorial and also including a more complicated diol. Parameters are derived in a streamlined, highly automated procedure that puts users firmly in control of the molecular model building.